Once again the American holiday of Thanksgiving rolls around and finds me out of the country, in Ireland. Having two very separate main branches to my family tree gets confusing: on my mother’s side, I can go back to the Mayflower, and one great-great-whatever managed the first grist mill in Plymouth; on my father’s side, it’s almost all dairy farmers in Cork and Carlow. This year I’ve become the proud owner of a small Irish cottage in West Cork, in sight of where generations of my ancestors lived. It’s not ancient—probably built in the mid 20th century—but it still has a cast iron cook stove, which originally doubled as heating for the main sitting area. I’m guessing it’s still functional and it burns solid fuel: coal, wood, peat, and for all I know, household trash. 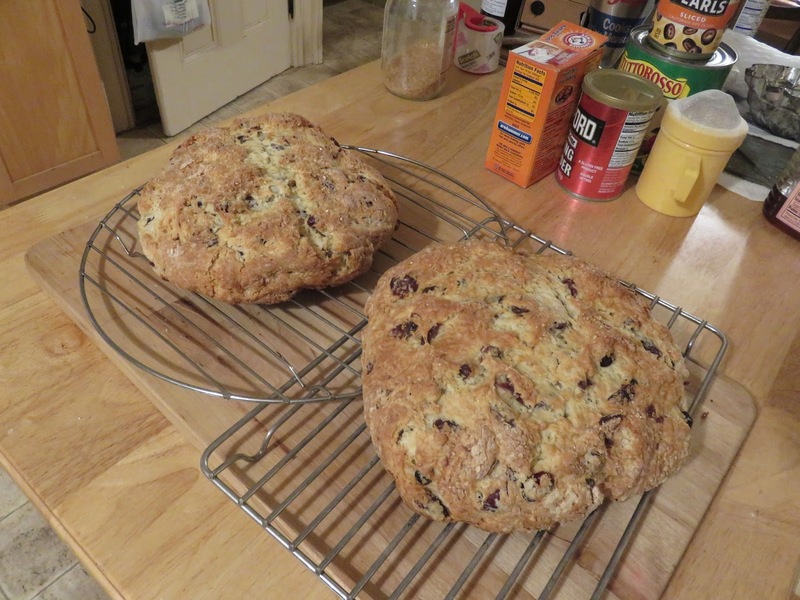 Looking at it, I can understand why the Irish bake so much soda bread, both light and dark. 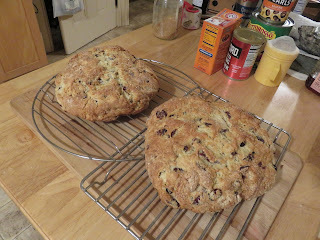 I think it’s a safe bet that the temperature of the oven is a bit inconsistent, but soda bread is very forgiving. I’m looking forward to trying the oven out, after a good scrubbing. Traditional Irish soda bread contains raisins or currants. As a nod to my American side, I’m swapping those for dried cranberries. After all, the corporate HQ of Ocean Spray is literally right down the road where I live, and I believe in buying local. Put the cranberries into a bowl and pour boiling water over them to soften for a few minutes. Drain. In a large bowl, sift together the flour, baking powder, baking soda, salt, and 6 Tblsp. sugar. In another bowl, whisk together buttermilk, egg yolks and whiskey if you’re using it (you could substitute vanilla extract if you like). 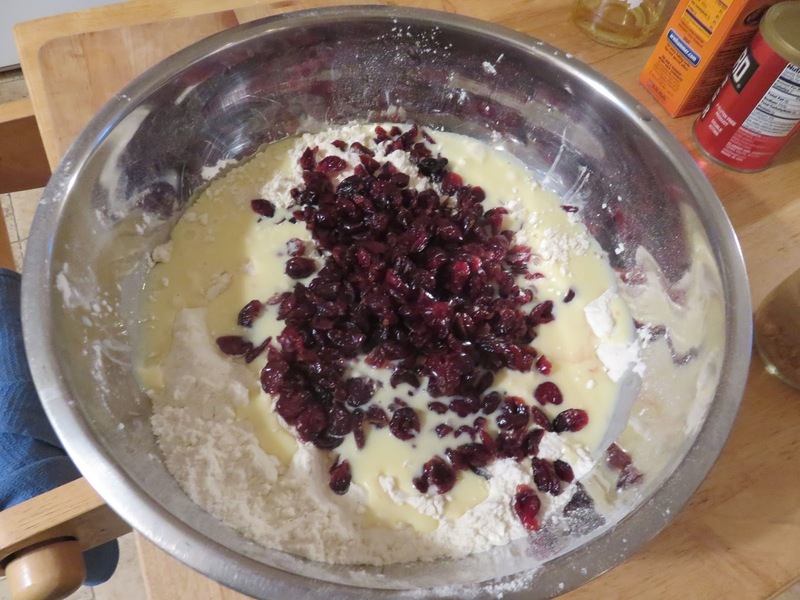 Pour the liquids over the flour mixture and scatter the cranberries on top. 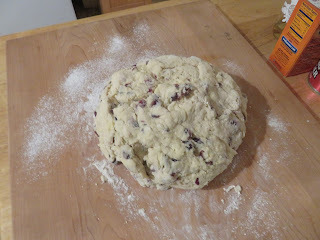 With a wooden spoon, stir the mixture to form a moist dough. 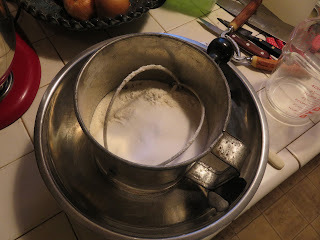 Knead the dough lightly in the bowl for 15 seconds. On a lightly floured counter or board, divide the dough in half. Form each half into a rounded half-ball measuring 5-5 1/2 inches in diameter. 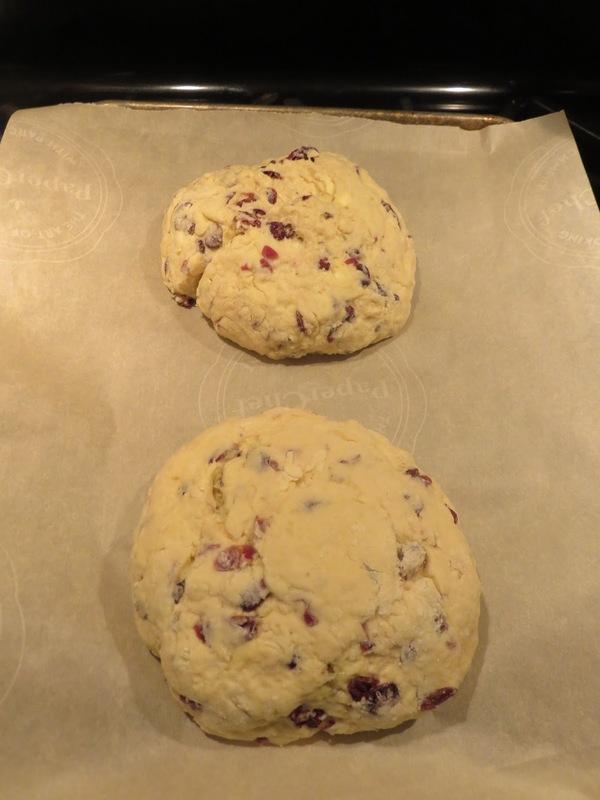 Place each ball on the lined baking sheet, 5" apart. With a small sharp knife, slash the top with a cross. Sprinkle the top of each loaf with crystallized sugar. Bake for 40 minutes or until the loaves are golden. Transfer to wire racks and let cool for 30 minutes. 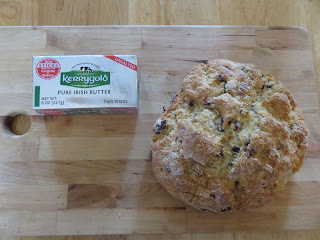 Serve with plenty of good Irish butter (try Kerrygold—I may have met some of the cows that contributed to that butter). You Can Celebrate Thanksgiving Anywhere! Coming in March 2017: Cruel Winter, the fifth book in the County Cork mystery series. There is a lot of new snow on the ground in West Cork, and an old crime to solve . . . I love that series Sheila so I added it to my March 2017 book release list. Enjoy your time in Ireland. 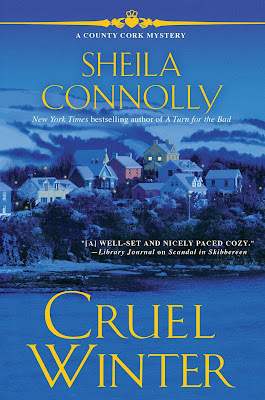 I'm in love with that cover, Sheila. It's beautiful! 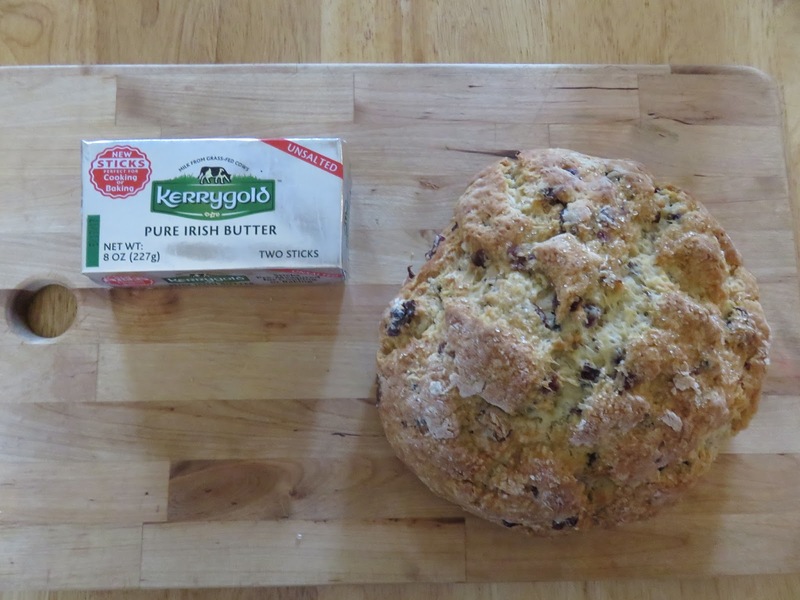 Thanks for sharing the Irish side of an American Thanksgiving. Have a wonderful holiday! This sounds wonderful! What a brilliant combination of your heritages. 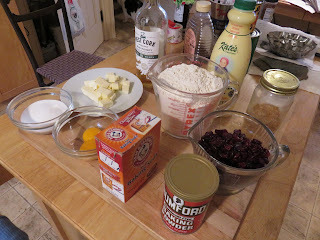 I guess if you plan enough ahead, you could soak the cranberries in the buttermilk and whiskey. Can hardly wait for cruel winter! Congrats on the house! The recipe sounds delicious! To me, it appears that if one uses Ocean Spray's frozen cranberries from our grocer here in Deming, NM, that it would not make a difference to the outcome. Isn't it weird how Ocean Spray's HQ is in Ireland! Living in New Mexico all my life, I've always pictured it Back East somewhere... Looking forward to trying it! What a nice easy recipe & a beautiful cover, too. You escaped! I am jealous . 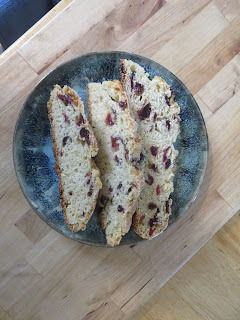 . . Debbie L.
Looks great can't wait to try this recipe. Thank you!